Is being part of air crew glamorous, enjoyable and rewarding? Yes. But it’s also hard work. Time away from home, your friends and family can be tough. You need to go the extra mile for the team and the passengers. If you’ve got that unique ability to stay calm under pressure, think around an issue and keep smiling all the time - this is the career for you! Cabin crew are amazing ambassadors for lots of reasons. They’re resilient, friendly, collaborative, proactive, supportive and caring. But everyone brings their own unique quality to the role. What is a cabin course, and what do you learn? Does it take that much time to learn how to serve coffee and tea? The cabin course is so much more than coffee and tea, as Bjørn Kjos CEO of Norwegian said “If it was only for the coffee and tea we could have used coffee machines onboard”. As a part of our recruitment process, we offer all of the training you need to become a great Cabin Crew. Please note that our training programs is tailored to fit the various clients needs, in which we recruit for, and may therefore vary. This article is an example of what you go through during training. At this moment we do not offer training unless you are involved in a recruitment process. During the weeks at course the cabin crew will learn all about the equipment, procedures and everything they need to know that we hope they will never use. The first day is easy, you will start with some information and introduction about the Company, and get your ID-cards ready if this haven’t been done already. You will have a short intro about aviation and the industry you are about to enter, and you will also have a quick review of the schedule for the course and everything you will learn for the next weeks. Day 2 and the learning begins. For the course you will learn about the fleet you will operate on. During the first days at the cabin course you will learn about the different positions on board, and also about the number of exits, where they are, how to use them, how they work, the slides and so on. You will also have a short brief of the emergency equipment, but this will be done more carefully later in the course. For those who are new to aviation there is a lot to learn, you will also learn how the aircraft manage to stay up in the air. You will learn all about Ailerons, rudders, elevators, spoilers, flaps, slats, landing gears and so on. Yes, it is a lot to learn, so prepare yourself for intense weeks with a lot on the agenda, and evenings and weekends full of study time. Most of the days working as a cabin crew fly by without any problems, and you will come home from work feeling that you have had another great day at work before heading to bed or getting ready for a new day. And this is what you will talk about during your first week at course, the “Normal Procedures”. – Putting on the uniform and getting ready for work while the rest of the city is still asleep. – Meet the other colleagues at the airport or in the lobby of the hotel you are staying in, both cabin crew and pilots. This is always 60 minutes before scheduled departure or at a arrange pick up time from the hotel. You will learn everything there is to know about the normal procedures onboard during the first weeks at course. It is all about procedures, everything you do onboard is a procedure, no matter who you are working with you will all know the same, and do the same regardless of the mix of crew. You will learn about all the different passengers you may take extra care of on board. Most of the passengers will manage fine on their own, and you might not spend to much time with them on a short flight, however there are some passenger who will need more of your tender love and care. This could be children travelling alone, disabled passengers, royalties, cats and dogs, pregnant passengers, prisoners, people who are being sent out of the country, blind passengers, intoxicated passengers etc. and the type that can be unruly and how to handle these types of passengers. Did you know that as much as 40% of the people traveling have some sort of fear of flying? It is the cabin crews job to make sure all people are taken good care of. You might need to tell them what all these noises are, and after the cabin course you will have no problem telling them that it is the Ailerons’ on the back of the wing making noises as it turns a long with the rudders. You will also have time during the cabin course to practice the announcements you will be making onboard. “Ladies and gentlemen, welcome on board this flight to…..” together with the safety demo, how to demonstrate all the equipment you will be showing the passengers. A thing that we do not want onboard, but is necessary to have knowledge of, is fire. You will learn a lot about how to fight different types of fire on board, how fire occurs, and also practice on extinguishing different types of fire. During the cabin course you will need to pass several test, and the first one is already in the second week, the “Initial Course Test”. You will need to pass this test to be able to proceed on to the next part of the cabin course. After this test the next ones will be coming at a high speed and the testing time is on. «Aircraft systems», «Emergency Equipment», «Emergency Procedures Test», «Wet drill», «First Aid Test» and «Final Test Session». You must pass all the test, including test in a simulator. So what do you need to know to pass all these test? During the course you will have instructors telling you everything there is to know about everything you will be tested on. The next test on the agenda is “Aircraft systems”. Hydraulic system, instruments, engines, toilet system, water system, PA system, fuel system, etc. It might feel overwhelming in the beginning, but it will all make sense in the end. Next test, the emergency equipment. You will learn everything there is to know about the emergency equipment, what they are, where they are, how many there is, how to use them, what to check pre-boarding to make sure they are all current and working and off course when to use them and how they will help you in different situations. At week three in the cabin course you will physically detect and recognize the equipment before being tested on them. Next subject is first aid, how you should handle passengers that gets sick onboard. You will learn everything there is to know about symptoms, what to look for, how to treat different symptoms and how to use the equipment we have onboard. And, off course a test about everything. You will not only read and hear about this, but you will also practice different scenarios. You will practice CPR on a doll, and how to use the defibrillator. During the cabin course you will get to see and look at all the equipment that is placed onboard, both for minor injuries like a headache and blisters, to medicine for heart attacks and allergic reactions. Next step is the «Emergency procedures», what do we need to know in critical situations. You will learn everything there is to do in all emergency situations that might arise during a flight. You will learn what to do in the different roles you have onboard, and what your colleague will do together with you. You will learn what to look for, what commandos to use or listen to, and so on. Well into the course you will have a wet drill. During the wet drill you will start off by swimming a number of meters, and when this is finished you will jump into the pool with a life vest. It will be a fully working life vest with Co2 patrons, so that you will get the feel of how it works. You will also do some exercises for different scenarios that you might need in a scenario where you land on water. CRM is a word you will be hearing a lot, Crew Resource Management. But what does it mean? Well, it is all about communication, and working together as a team. We need the communication between the crew members always to be on top, and helping each other in every situation. When this day is over you will have one last chance to go home and spend one last evening of reading up and repeating to yourself before the final test. 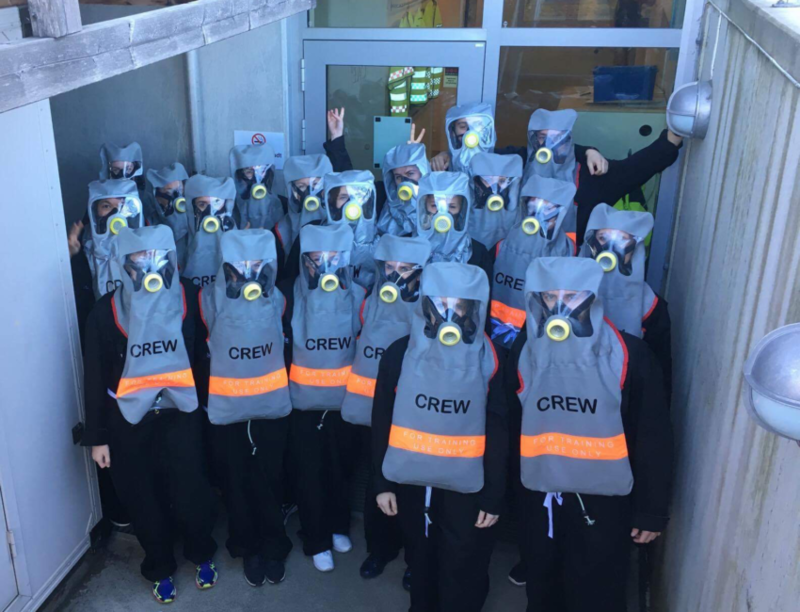 Each one will have a go at a scenario on the final day, you will be divided into groups and the instructors will decide what to test you in. You will also need to open the doors at the simulator and show that you can manage an evacuation. – Take responsibility for the safety and welfare of your passengers. – Before departure, ensure that safety equipment in the aircraft cabin is in order and in the right place. – Demonstrate the correct use of the emergency equipment – providing that it has not already been shown on film, on board before takeoff. – Greet your passengers and provide service throughout the flight by for example; serving food and beverages or selling products. – Be expected to answer questions from passengers, and take care of problems that may arise during the flight, for example; if a passenger were to feel uncomfortable or becomes ill during a flight. – Solve any challenges that may arise in a calm and professional manner. – Balance your passion for customer care with your ability to maintain the highest of safety and security standards at all times. Although your learning won’t stop there. Working in a business, where you follow strict rules from the authorities, means you’ll have yearly exams and you’ll be tested on safety in your pre-flight briefings, all in the name of safety. Upon successful passed initial course with OSM Aviation you will hold an EASA attestation and get a job interview with one of our associate airlines. Holders of an EASA cabin crew attestation will be able to seek employment as cabin crew with any European airline without having to pass a new initial course.